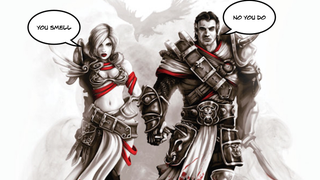 Late last week, the makers of the new RPG Divinity: Original Sin sent out one of their regular update reports. They had patched out some bugs, fixed some crashes, and oh yeah, they'd turned off global chat because too many people were being jerks. "We switched it off for now as there was just a bit too much profanity and insulting," Larian's Swen Vincke wrote, "and while we have good hopes that it may get better if people read this this, we'll also install some proper moderation tools & processes. Once that's done, we'll switch it on again." Global chat does what the name implies: It's a chat room in the lower-left corner of the screen that's wide open and theoretically lets anyone playing the game chat with anyone else. That's in contrast to local chat, which lets you talk with your co-op partner only. A few weeks ago I played a bit of an early build of Original Sin when it was still on Steam Early Access, and remembered seeing a bunch of random chatter in the global chat window from the moment I started the game. I mostly just skimmed, but it seemed like people were trading tips, complaining about tough battles and sharing character-build recommendations. After a while I toggled over to local chat and left things silent. Last week the full retail game came out, and at first, it came complete with the same default global chat that had been in early access. Earlier this week, I reached out to Vincke to find out more about what happened between the game's launch and the decision to pull the plug. "The very minute that [global chat was activated in the full game]," Vincke told me in an email, "it seemed like the floodgates of hell were opened and all we saw was insults and shouting at each other. This was a big contrast with the rather friendly chat we had been enjoying until then in which players generally tried to help each other. We looked at it for 10 minutes, saw that it was only deteriorating and decided to pull the plug. There's a certain type of fun we're aspiring to give people, and insult matches aren't part of the vision." "It seemed like the floodgates of hell were opened"
I asked Vincke whether he thinks a game like Divinity: Original Sin needs global chat, or whether it could live without it. "[The game] doesn't need it," he said, "but it's a big game and from time to time a helpful hint can make a big difference. During early access, we saw a lot of people seeking advice about character builds from veteran players, for instance. There are so many options to make life hard for yourself that a little bit of guidance can go a long way. "Another example are puzzles - some people will do everything it takes to find the solutions themselves, others hate puzzles in RPGs and want to get to the solution asap. Instead of having to jump out of the game and visit a forum, the global chat allowed them to just ask the question to the community. And then there's of course the fact that you can you drop into anybodies game in D:OS, and a global chat facilitates finding people to play with." That's definitely true - I really like Original Sin but the game has a steep initial difficulty and new players could certainly benefit from some advice to keep them from making poor decisions early on. Vincke says that they'd like to bring global chat back in some form or another, including adding multiple chat channels, a feature many fans have been requesting in the game's forums. "Having multiple channels is definitely on our list," Vincke said, "but it's a long list. "Once the storm of people playing D:OS simultaneously is over we'll probably activate it again. We don't like censorship but we also think that people who buy D:OS buy it to have fun, and not because they want to see some people offend others. It's a real pity though - apart from a few isolated instances, we never had the same problem during Early Access and we had silent hopes that it was going to be ok. We figured it was a least worth a try."